2. 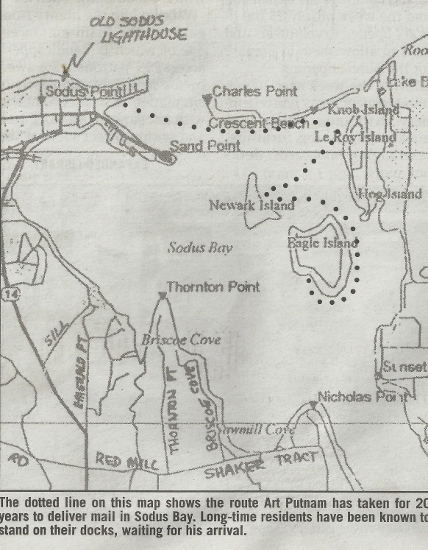 According to the United States Postal Service, Sodus Point is one of 12 places in New York State where mail is moved by boat. 3. According to the United States Postal Service, New York has more locations where mail is delivered by boat than any other state. Story from Lakeshore News, July 31, 2013 addition. Boat Mail Delivery Goes the Extra Mile on Sodus Bay by Neil Thompson; photos by Bill Huff , Jr..
Art Putnam pulls his 19-foot, V-6 Chaparral from its Sodus Point dock and heads for Charles Point. He notices the 5 miles per hour marker in the water, and waits until he passes it before kicking up his Chaparral to about 20 miles per hour. Once he arrives at Charles Point, he carefully pulls up to a dock, trying not to put another scratch on his well-worn boat. He opens a mail box and places a bundle of letters inside. It’s about 8:30 a.m. and Art has just made his first delivery of the day. He’s dressed in a blue pullover shirt with a postal service logo, white shorts, and sneakers. He doesn’t pound the pavement. He doesn’t even work directly for the U.S. Postal Service. Instead, he works on a contractual basis. 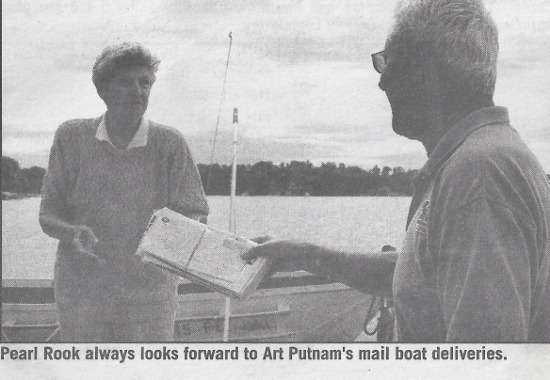 But for 45 households along his 8-mile mail route through Sodus Bay, he’s the mailman. front porch of a cottage. “Personalized service,” he says. he calls out to a Newark Island resident after leaving the day’s mail. two feet deep. The bass boat makes it through. “He’s lucky,” Art says. the waters countless times on boats. As a scuba diver, he’s been below the bay’s surface. He’s even been on the bay with water skis. piece of mail simply says “resident’,” it’s no big deal. The islanders can sort it out. the mailbox and raises the mailbox flag to let residents know that mail waits for them. to cut short that day’s mail delivery. about $3,000 on 91 octane fuel in a typical season, which lasts from May 1 to Oct. 30.
replace it. He continues on, passing docks on Eagle Island, some of which he installed. from home, knowing the islander needed it. “It’s just a little extra service,” he says. He can also sell stamps and boxes. “Whatever the post office offers, we offer out here,” he said. Art pauses to take a cell phone call. Gone are the days when he used ship-to-shore radio. phone away and continuing his journey. could lose a piece of mail in the wind. 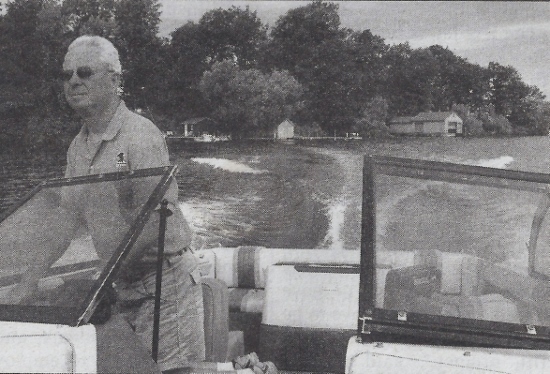 Heading back to his Sodus Point dock, he talks of the changing lifestyles on the islands. see the Shopper and newspapers. Bills? Not so much. as a backup in case his Chaparral has mechanical problems. about $2 million in liability insurance, which he said costs him about $1,700 per year. certified mail. He found the customer – on a sailboat. learned the route as a boy when the late George Helfer used to let him ride along. layers of life in Sodus Bay. driver does not look out the window to check the waves or the wind. Art took over the route from his brother-in-law, Ed Krenzer, who had it from 1966 to 1993. 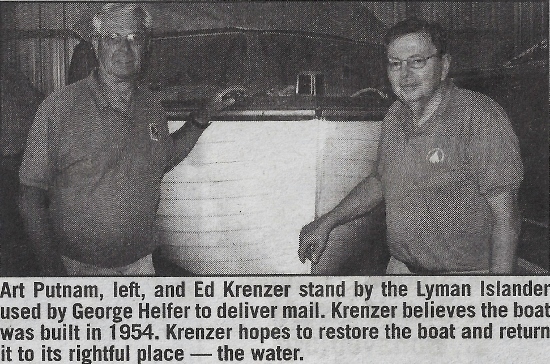 Ed, who together with his brother Paul used to own Krenzer Marine, remembers the boat route fondly. Ed said he enjoyed seeing his postal customers each day. Ed in turn learned the route as a boy when the late George Helfer used to let him ride along. 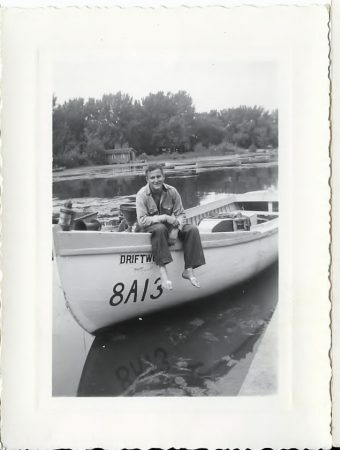 George Helfer used his boat “Driftwood” to deliver mail around the bay for many years previous to 1966. George Helfer’s boat “Driftwood” is pictured above. The young man in the photo is believed to be Bill Helfer. Photo courtesy of Art Putnam and the Miller family.